Spacious studio condo. Quiet location at end of the building with a peek of Cape Cod bay! Front yard has a large swimming pool and picnic area with barbecue grills. Dine or just relax on your private balcony overlooking the backyard and Cape Cod Bay. Cool ocean breezes at your sliding door. Two queen-size beds! Full bath with tub and shower. Stay in beautiful serene Truro and visit lively Provincetown by taking the shuttle bus from the front yard! Find fabulous fishing, boating, and swimming in the ocean or the bay - Truro has some of the best public beaches in the country! Under a mile to closest beach. Hiking and biking trails, art galleries,golf and historic museums all just a few miles away in Wellfleet and Provincetown. Air conditioning and a ceiling fan are provided to keep you cool. We just love the outer Cape! Our family has vacationed in North Truro since 1947. When the cottages we used to stay at for many years were being sold, we found this terrific condo just a mile away so we can go to the same great beaches, take the same hikes, visit Provincetown and Wellfleet, etc. Full tub and shower combination. Window in bathroom. Baseboard heat in the main room and separate heat in the bathroom as well. Both queen beds will be made up. for the bathroom. Please bring your own beach or pool towels. Daily towel exchange at the condo office 9-10:30 am. Place settings for 5 , in case you have a guest! There is a second dining table on the balcony, that seats 4 as well. large common lawn for games, picnic tables, etc. Lounge chairs, Tables and Shade Umbrellas are available on the pool deck. We love the swimming pool! Ceiling fan and air conditioner.. Large yard. No Smoking please & No Pets allowed per the management. Smallish but bigger than it looks - two king size beds with space around. Bathroom could do with a refresh and air con unit a bit noisy but otherwise had everything you could need. This condo was a great choice for our vacation. It was in a peaceful area but very close to the action in Provincetown. We really enjoyed the ease of going to the beach whenever - a quick five minute drive and having so many close beaches to choose from. The property was as pictured and the layout was great. The condo was so clean - exceptionally clean. I especially liked that this is an end unit so there was more privacy than found at the other units. The pool was wonderful!!! These days it is very rare to find a place with a pool that has a deep end and doesn't have restrictions for using floats in it. We had a great time and will definitely recommend this place. We really enjoyed our first time at the Cape. The condo had everything we needed. (The owner made sure I had a hair dryer, as requested.) We're not big on crowds, so this was a lovely time to visit with no traffic and no long wait times in the restaurants. The weather couldn't have been better! Dawn was very friendly and attentive to our needs. I loved the fresh decor of the condo and the cleanliness. I was pleased not to have to pay an added cleaning deposit. : ) Wish we could have stayed longer!! Thanks! 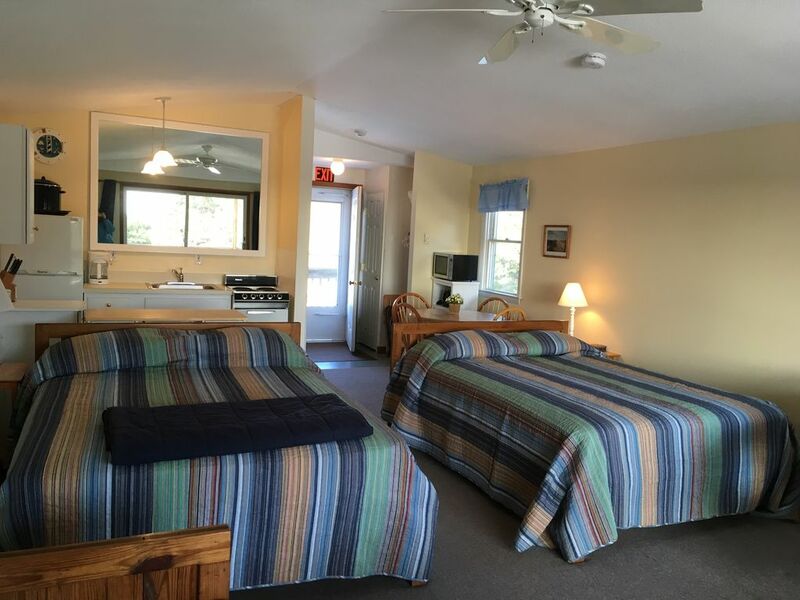 It is a really nice and well equiped studio to stay in Cape Cod. We enjoyed the quietness of the place and its proximity to Provincetown. The private deck is perfect to take breakfast or dinner and enjoy a beautiful view. I strongly recommend this place! We feel so lucky, and keep counting our blessings when we drive by other places, as to how much more enjoyable, easy, homey and well-thought out this end-unit condo with a pool near the beach really is! It's sparkling clean, with nice pillows, light but warm cotton quilts, a little patio with furniture that is comfortable and durable, great mattresses, a kitchen that is well thought out, and all the little accoutrements that make a place to stay the kind of place you might just call home when you're out exploring and you say, let's go [----]. Thank you for making this such a lovely memory for all of us, even little Nora who promises when she's 50, she'll remember her time here, and say, i remember! PS you can tell the owner stayed here (like they say one should do) to see what's needed. it's all anticipated. small, sweet, and charming. great cricket sounds and summer gusts of winds too. Three quarters of a mile to the closest beach- or swim and sun in the pool right out front! Hiking & Biking Trails through the Provincelands & by the Truro Beaches, Tennis & Gym found in Provincetown, Fishing in the ocean or bay, Guided nature hikes at the National Park Service visitor centers, All in nearby Provincetown, Swimming - ocean, bay, lakes, or swimming pool, take your pick! Snorkeling & Diving, Historic Lighthouses, Highland links Golf Course facing the Atlantic Ocean. Credit cards may be used for payment, but a echeck is preferred for the rental payment. The one-night rental charge in high season is $255, shoulder season one night $175.One night rentals will be accepted between longer rentals.